As I’ve covered before, shortly after my wife quit her job, she joined a couple of her previous coworkers in starting a business of their own. As anyone who has started a business of their own knows, there are many, many unexpected things that can come up. With proper planning, many of those things can become less of a shock when they happen. One way to do that, and one that the accountant that was helping my wife and her partners get started required, is business insurance. It can come in many small variations, but in general terms, it is insurance that helps protect you and your company against liability and litigation. It also can act as insurance against interruptions in business. If your store floods, and you have to close for a few days, it will help defray those costs. Your coffee burns someones tongue off? It’ll help with that as well. With the particular type of business that my wife and her partners were building, liability insurance was the most important part of their business insurance package. They work daily with clients in a variety of locations and scenarios and as such, need an insurance that will cover them for liability if someone were to get injured while at one of the locations or in transport to the location. That part of the insurance was much more important than having insurance for a office location (at least right away since they didn’t have an office for several months.). Where do I get business insurance? 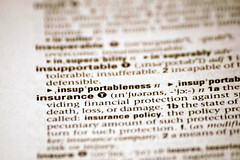 Getting business insurance isn’t as difficult as it may seem. In fact, it might be as easy as getting a referral, like my wife and her partners did. A quick look through your local phone book will likely get you some prospects as well. And in many cases, if the agent you talk to doesn’t offer business insurance, they’ll happily refer you to someone who does. Much like any other type of insurance, there are plenty of websites that offer quotes and services. And, much like any other type of insurance website, it’s difficult to weed out the ones that are really there to help and which are there to make themselves a quick buck. Much like anything else involving your business, business insurance really needs to fit your business. Your responsibility as the business owner is to check and double check to make sure that the coverage fits your business and will cover all the necessary situations. Getting a sub-standard insurance just because it was the cheapest could cost you money, or worse, your business.